I wanted to take a look at the Apogee Symphony because I could either use it as my HDX interface or pull it out and use it with my MacBook Pro laptop as a USB interface. The review interface is the 8x8 with 8 mic preamps, which is very useful especially when I am out on the road all I need, is the Symphony and my laptop, that’s it, because there are 8 Apogee mic preamps in the interface. Of course that’s not the only configuration, there is the 2x6 with 2 balanced line inputs and 6 balanced line outputs on a 25 way D type as well as AES and SPDIF I/O is the baby of the range. 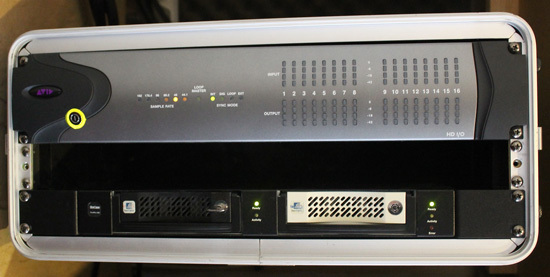 Next there is the 8x8, which has 8 channels of analog I/O and 8 channels of digital I/O. Then there is the 16x16, which gives 16 channels of analog I/O again on 25 way D types. But these are the standard configurations, because there are two card slots you can mix and match, so you could have a 16x16 with 8 mic preamps for example. But for me in my studio, 8 channels of I/O is fine. For outputs, I can work 5.1 and stereo, and for inputs, I have 8 analog inputs but in reality the only analog ins I use these days, are a couple of mic preamps for voiceover and commentary recording or instrument overdubs, all the rest comes in the box from clients projects. The first thing I did was to pull out my Avid 8x8x8 and fit the Symphony in the rack in its place. They are both 2U units and the audio I/O is the same – 25 way D type connectors. However unlike the Avid interface the Symphony also needs a USB connector to enable you to configure it using the Apogee Maestro software. In addition I had to get an Avid Mini Digilink to Digilink adaptor as the Symphony has the 192 style connectors on it. 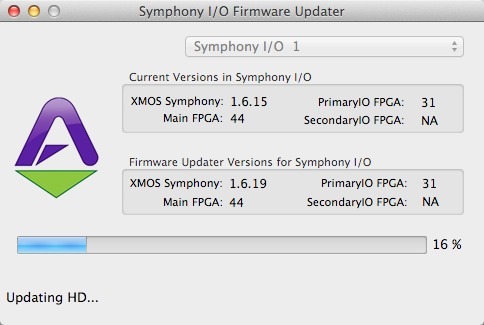 I installed the Symphony software bundle and immediately I powered up the Symphony I got a warning message the Firmware in the Symphony needed updating, so I agreed and after a few minutes it came back updated. 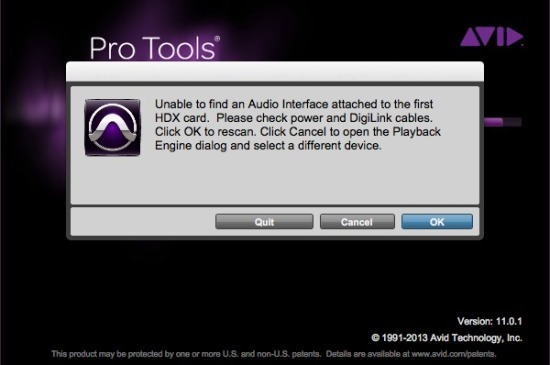 Next I booted up Pro Tools and it reported it couldn’t find an interface connected to my HDX card. I rechecked the manual and struggled to find how to resolve this. I rechecked that I had connected it correctly, I opened the Maestro software but it seemed to be locked in USB mode. So I went on the Apogee site and went in the Knowledge Base and after a little digging found the page about the Audio Interface Mode (AIM) and the explanation that I needed to push and hold in the right hand rotary encoder on the front panel of the Symphony and that would enable me to change modes. Now I understood this, I did find the same information in the manual quite quickly but it would help to have all the information about configuring the Symphony with Pro Tools on one page, rather than the connection details on one page and configuration on another page. It was also a shame that changing the Audio Interface Mode is the one thing you cannot do in the Maestro software, but I noticed that as soon as I had reconfigured it from the front panel the Maestro software acknowledged it was now in Pro Tools HD mode. 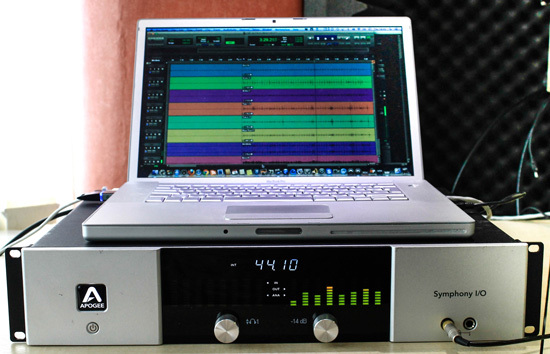 The Symphony can work in four modes, USB, Pro Tools HD, which I have already covered. 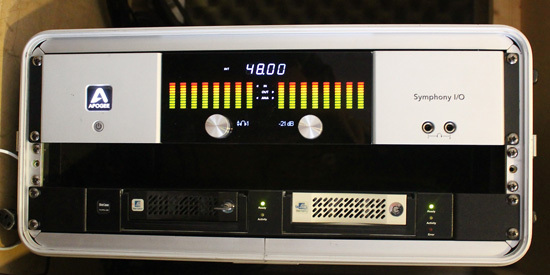 Symphony, which enables you to connect to a Symphony 64 pci-e card, and finally, Standalone mode which enables you to use it as a set of mic preamps or a mixer using the outputs. Now I had it in Pro Tools HD mode, Pro Tools 11 was happy. 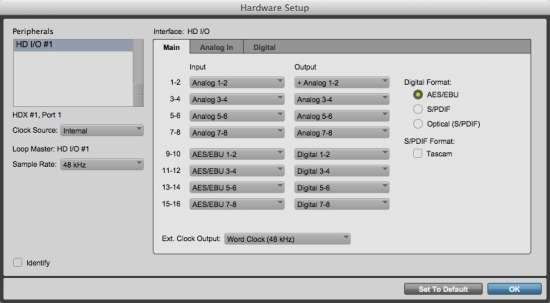 Looking in the Pro Tools Hardware window, Pro Tools cannot tell the difference between my Avid 8x8 and the Apogee Symphony, it appears at an HD I/O just as my Avid box does. The other thing I noticed very quickly was that the fan on the Symphony appeared very loud, so I got out my sound pressure meter and it measured 48dBa at 1m in my computer cupboard with the door open, close the door and it drops down to 28dBa. This compares to 44dBa for my Avid 8x8. Both measurements include the noise from my Mac Pro and all my drives, because subjectively the Symphony sounded a lot louder, I could clearly hear it was on where as it has hard to hear the additional noise from my Avid interface’s fan when I powered my 8x8x8 up. Then I realized that the audio level coming out of the Symphony was a little low, so I went to the front panel and set the left hand rotary encoder to the main output and then found the output was set to -20dB. Once I had turned this up then I was very close to calibrated. Back into the Maestro software and on the Output tab there was a button to show Trim controls, once displayed there were trim controls with 2dB of trim up and down which enabled me to adjust the outputs to be exactly PPM4 for -18dBu – result. Working with the Symphony interface instead of my Avid 8x8 was fine, in many ways it was the same including the Identify feature lighting all the lights up on the Symphony, but as I worked with the Symphony I started to notice that I could hear things slightly differently, I wasn’t able to do a direct A/B comparison or a proper double blind listening test to confirm it but I did prefer what I was hearing through the Apogee Symphony. So that was using the Symphony with my HD rig, but what about being able to use it with my laptop as a USB interface with Pro Tools 11? I pulled it out of my computer cupboard and hooked it up to my laptop, changed the Audio Interface Mode to USB I/O and Pro Tools recognized it immediately. Once I had installed the Maestro software, the headphones on the front panel picked up outputs 1 & 2 and away I went. It was great to be able just take the Symphony and my laptop and be able to record up to 8 mics. You need to have a DB25 to XLR loom as the mic inputs use the same inputs as the line inputs on a 25 way D type. I often need to be able to record small set ups whether it’s a round table discussion for a radio documentary or an acoustic set for a TV programme. The Latency was no different as any other interface as I was using the Symphony as a USB interface. I was able to set the HW buffer size in Pro Tools to 32 samples even on my ageing MacBook Pro 2.4GHz Intel Core Duo running Pro Tools 11 which its not really supported for, and everyone was happy with that. My only concern is the noise of the fan, although it was much quieter out of my computer cupboard it is still an issue and I found myself hiding the Symphony away to try and reduce the noise from the fan. The fan is clearly controlled by sensors because the speed would vary over time but for an interface, I would expect to be able to use in the room, this was the only disappointment. The sound is great, as I would expect from Apogee, having only one interface for location and studio work would be excellent and if I was buying my HDX rig now the Apogee Symphony would be a serious contender and if they could do anything about the fan noise that would be even better. The Symphony list price for the top of the range 8x8+8MP is $4490, if you went for a 2x6 that would be $2495. The US price for my Avid 8x8x8 is around $4000 so to get the mic preamps as well makes the Symphony an attractive price. The fan is unfortunately necessary in Symphony I/O due to the fact that it’s a high performance, high channel count interface. Much in the way that a race car needs a fan to cool its engine, Symphony I/O could not function at the same specifications without this. It is regulated by a temperature sensor though and only comes on when absolutely necessary. Users with a single module may never have the fan come on at all, but in your case, you had both the 8x8 and Mic Pre modules installed, thus causing more heat. As of late 2012, all new units feature a modified chassis design to help maximize air flow, thus helping reduce the fan speed and the amount of time that it is on. For chassis manufactured prior to this design change, we offer a magnetic strip that can be easily attached to the left side of the unit and offers the same result. Any customer who thinks they may need the magnetic strip mod should contact Apogee Technical Support. Unfortunately it seems as though the unit sent to you did not have this new chassis design. Thank you to Apogee for clearing up these concerns and explaining why some users have had no problems with the fan whilst I needed to work round some problems I experienced with fan noise.